Learn yoga basics with expert guidance in this introductory yoga for beginners course. The Basic Beginner Course is the first part of the four-part Yoga Selection online beginners program. Progress from beginner to intermediate in 18 video classes. The Yoga Selection beginners program is the most comprehensive and structured beginners program available online. It will help you to build a safe and solid foundation for your yoga practice. Once you complete the four-part beginner program you are then ready to progress to intermediate level classes. If this is you, start your Yoga Selection journey here! Whilst doing this course, you will feel your body work in a way it may never have done before. Afterwards you will notice a feeling of calm. This is part of the positive effect yoga has on your mind. Keep practicing and you will begin to notice yourself changing. You may start to notice feeling stronger, more flexible, more energetic and less stressed. Your concentration may be more sustained. Get ready to start feeling like a more balanced and healthy version of yourself! I used to practise Iyengar 20 ys ago but drifted off – i now have bad right knee due to ski accient/arthritis. It sounds like you are working intelligently with your knee. It is common for people with inflamed knee, or arthritis to have difficulty with a deep kneeling position. Unfortunately, from my experience, avoiding the action all together does not seem to improve the long term health of the knee. Neither does pushing the knee into painful positions. The middle ground would be, as you suggest, to support the knee with folded blankets or other props whilst working with challenging poses. 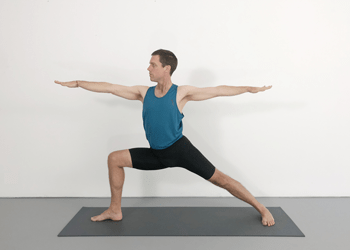 A good approach may be to work with supports in kneeling poses, but with a bigger picture of focusing on improving hip mobility to take pressure off your knees, working towards strengthening your quadriceps muscle group to reinforce the knees. I will be making some knee classes very soon with you in mind. Please keep an eye out for the class. Namaste. When Rod instructs “shoulder blades move in” does this mean moving towards the midline of the body (medialy), or more pushing towards the front body (deep). I find both feelings helpful… but as I move forward I wish to articulate appropriately. Shanti. I’m going to go back and listen to some instruction from previous videos. So often it’s something that’s been explained but un-heard because of inexperience. Will check. Shanti. Great beginners course. Thank you for the instruction. I truly appreciate the Iyengar method and find your online course a great way to re-establish my home practice. I’m glad my teaching style works for you. Wonderful that your yoga practice has become more regular with the website. Thank you for your feedback.